Well, the first 5 picks at least. After a rocky start, Trae Young has put together a great rookie campaign. As we approach the end of the NBA’s regular season, awards conversations are all the rage. As usual, the two most talked-about races are for Most Valuable Player and Rookie of the Year. Whether it’s “Get Up” or The Jump, Sports Illustrated or CBS or NBA TV, or even NBA players themselves, everyone’s got an opinion on who should take home the hardware at the end of the season. The Rookie of the Year debate, at this point, pretty much boils down to the Mavericks’ Luka Doncic, who stormed out of the gate and grabbed onto front-runner status fairly quickly, and the Hawks’ Trae Young, who started off terribly but has been shining during the season’s second half. But lost among this debate is this: The entire 2018 NBA rookie class — or at least the top five picks — deserves an award. Collectively, they are having the best debut season of any group of top five picks in more than 25 years. Doncic (pick No. 3) is carrying averages of 21.2 points, 7.7 rebounds and 5.9 assists per game while acting as the primary facilitator and scoring option in Dallas. He is only the second rookie in NBA history to average at least 20, 7, and 5 in those categories, and the other is Oscar Robertson, who did so during the 1960-61 season. The man whom Doncic was traded for on draft night,1 Young, has been nearly as productive, albeit less consistent, in his debut season for Atlanta. Young’s season-long numbers of 19.0 points, 3.7 rebounds and 8.1 assists per game are strong.2 Those numbers, though, are dragged down by his poor start to the year. Since the All-Star break, he’s averaging 25.0 points, 4.6 rebounds and 9.2 assists a night, with shooting numbers that are far better than those he was posting earlier in the season as he struggled to adjust to the NBA game. Two of the first five picks in a given draft looking this good, this early, would be impressive on its own; but Doncic and Young are not alone in their shining debuts. The other three players selected in the top five — the Suns’ DeAndre Ayton (No. 1), the Kings’ Marvin Bagley III (No. 2) and the Grizzlies’ Jaren Jackson Jr. (No. 4) — have each been pretty damned good this year too. Ayton has been a monster offensive force for Phoenix from Day 1, and he is already one of the league’s best post scorers and offensive rebounders. Among rotation players averaging at least 2 post-ups per game, per NBA.com, Ayton’s 1.03 points per play on post-ups ranks third, behind only Joel Embiid and LaMarcus Aldridge. Ayton’s offensive rebound rate, meanwhile, ranks 22nd among the 263 players who have qualified for the minutes per game leaderboard. And he’s been improving on defense throughout the season. Bagley is averaging 14.8 points and 7.4 rebounds per game off the bench for the surprisingly frisky Kings. And he’s been even better since returning from a five-game, injury-related absence in early March, posting 18.5 points and 8.2 rebounds a night with an improved shooting line. He has a diverse, varied face-up game and is working to stretch his jumper, and given his athleticism and quick feet, his defense could eventually come around as well. Memphis shut down Jackson in late-February due to a quad injury, but before his season ended he averaged 13.8 points, 4.7 rebounds and 2.3 combined steals and blocks in just 26 minutes a night. He did all that despite being, at 19 years old, the second-youngest player in the league.3 Jackson also knocked down 35.9 percent of his threes and carried an above-average usage rate and true shooting percentage, which is wildly impressive for a player whose primary contributions were expected to come on the defensive end of the floor. As you can see, the 2018 class fares extremely well in both win shares — which represent Basketball-Reference.com’s attempt to divvy up credit for team wins to the individual players on the team — and win shares per 48 minutes. The 21.1 win shares collectively accumulated by Ayton, Bagley, Doncic, Jackson and Young ranks eighth among the last 40 draft classes during their respective debut seasons, while their win shares per 48 average of 0.102 makes this class one of just six to exceed 0.100 win shares per 48. One of those six classes (2009) saw only three players actually take the floor during their debut season, thanks to an injury that knocked Blake Griffin out for the year and Ricky Rubio’s contract with Barcelona that kept him in Spain for two years before he arrived stateside. Hasheem Thabeet, James Harden and Tyreke Evans saw varying degrees of success during their respective rookie years and ended up posting a collective average of 0.108 win shares per 48 minutes, but they also combined for only 11.9 total win shares, far fewer than the other five classes that stand out in this analysis, each of which exceeded 20 total win shares. It’s worth noting, then, who was actually taken in the top five in those five NBA drafts (1984, 1979, 1982 and 1992). 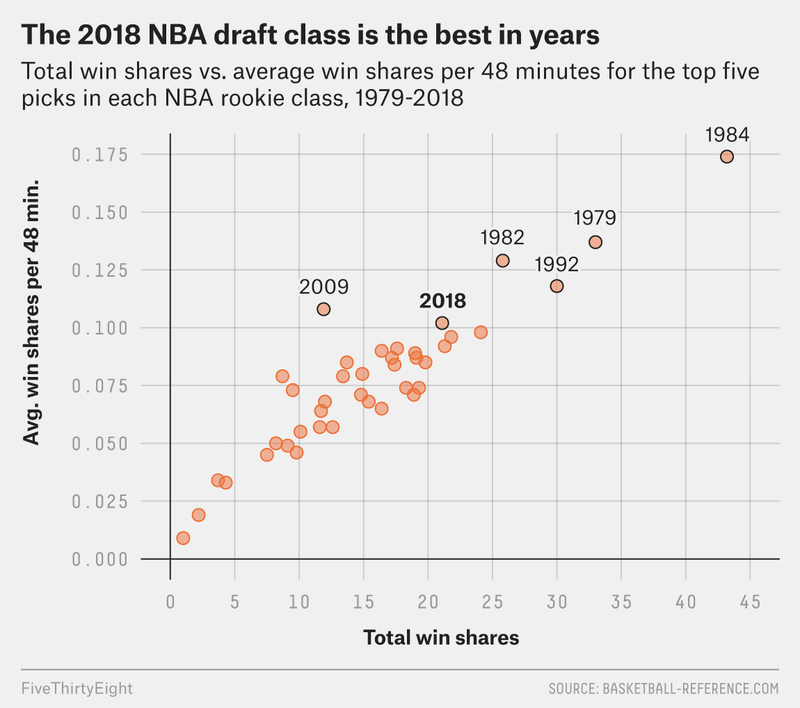 It’s also worth noting that just a single class between 1992 and 2018 saw its top five post a win shares per 48 average better than 0.100, meaning it’s been nearly a generation since we saw an actual top five class debut with a performance as good as the one we’re seeing from the most recent draft class. Among the 20 players selected in the top five of those four drafts, eight are currently in the Basketball Hall of Fame. Another four — Bill Cartwright, Sidney Moncrief, Terry Cummings and Christian Laettner — made at least one All-Star team during their career. And six more became long-term rotation players. Only Greg Kelser and Bill Garnett failed to pan out at all, as they wound up out of the league entirely within a few seasons. That’s an incredible hit rate of solid NBA players, and bodes well for what we should expect from Ayton, Bagley, Doncic, Jackson and Young in the future. It’s obviously far too early to predict that any of these players will be enshrined in Springfield one day, but the future certainly appears bright, and it seems likely that the 2018 draft class will be remembered as one of the best in quite some time. The Hawks drafted Doncic and traded him to the Mavericks in exchange for Young and Dallas’s top-five protected 2019 first-round pick. He’s one of only three rookies to have gone for 19, 3 and 8 per game. The Lakers’ Isaac Bonga is about a month younger than Jackson, and Bonga has played less than 100 minutes this season. It also applies to Jonas Valanciunas (stayed in Europe for a year before coming over and joining the Raptors); Blake Griffin (injured); Ricky Rubio (Europe); Greg Oden (injured); Danny Ferry (went to Italy for a year because he refused to play for the Clippers); David Robinson (naval service); and tragically, Len Bias (an overdose-caused death).